David Bowie has released a new music video, “The Stars (Are Out Tonight),” featuring the second single from the new album The Next Day, and Bowie-doppelganger actress Tilda Swinton. 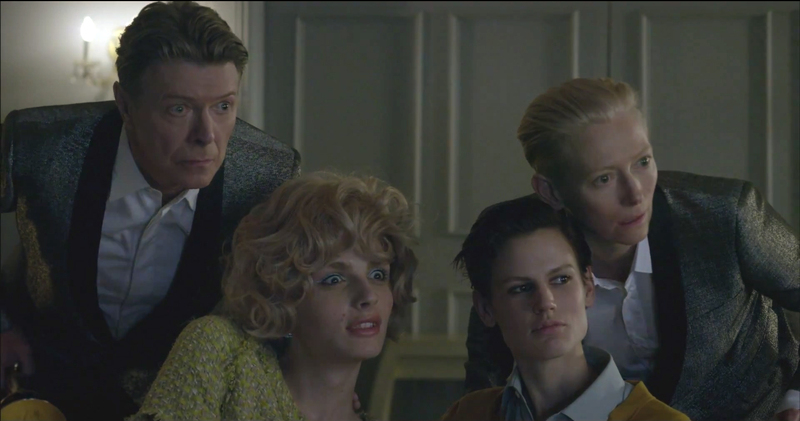 Bowie says the short film depicts “a twenty-first century moment in its convergence of age, gender and the normal/celebrity divide.” David Bowie and Tilda Swinton play a 50’s style couple enjoying a typical suburban life (albeit exquisitely dressed) until they are preyed upon by a celebrity couple (supermodels Andrej Pejic and Saskia De Brauw). The “stars” cruelly antagonize this “normal” pair as they invade the Bowie-Swinton psyches in a variety of guises – particularly transforming the magnificent Ms. Swinton in exactly the gender-bending way fans could only dream of. Norwegian Model Iselin Steiro also appears as a young David Bowie look-alike that lives next door. Film director Floria Sigismondi gloriously depicts one world vampirizing the other, an atrociously perceptive view of our current societal obsession with tabloid voyeurism. Filming was shot by director Floria Sigismondi via Black Dog Films with executive producer Coleen Haynes, producer Oualid Mouaness, director of photography Jeff Cronenweth, art director Adam Davis, costume stylist Jerry Stafford and editor Jarrett Fijal. ISO Records commissioner was Bryan Younce.